This simple recipe, with it's sweet and savory familiarity, yet sophisticated flavor combinations, is destined to become a favorite in your household! Peel and slice the carrots into ¼” thick coins. Combine them in a ziplock bag with the olive oil, salt and pepper. Shake to evenly coat the carrots. Pour the carrots onto the parchment-lined pan and evenly spread them out. Roast in a 400ºF oven for 15 minutes. Meanwhile, prep the tilapia. Crush the pistachios and stir them together on a plate with the fresh parmesan cheese so that they are evenly combined. Coat each piece of tilapia with mayonnaise. Next coat each filet on both sides in the pistachio mixture. After the carrots have cooked for 15 minutes remove them from the oven and turn the oven up to 450ºF. 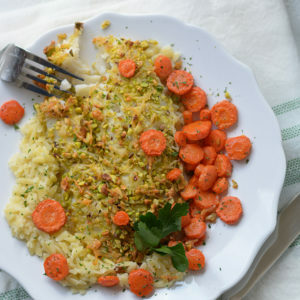 Flip the carrots and push them towards the sides of the pan to make room for the tilapia filets. Arrange the four pieces of coated fish along the center of the pan. Return the fish to the oven and cook for an additional 8-10 minutes. The fish is done cooking once it starts to become flakey and reaches an internal temperature of 145ºF. *Packaged garlic couscous or rice pair well with the tilapia and carrots. This is also delicious served with orzo.